One of the evergreens of classical mechanics demonstrations is the behavior that can be elicited from a gyroscope. 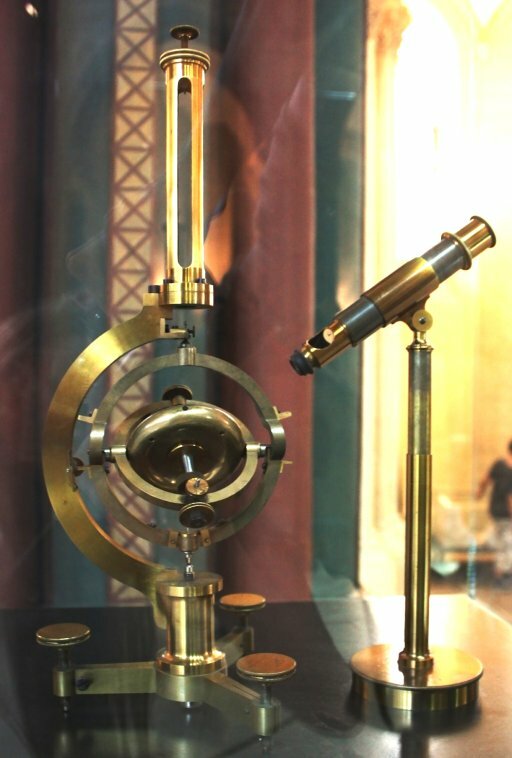 The word 'gyroscope' was coined by the french physicist Foucault. Foucault was active in optics, in the manufacturing and testing of lenses and mirrors, in the chemistry of photography, and he did research in electromagnetism. Today he is mainly known for the pendulum setup that is called 'Foucault pendulum'. In 1852 Foucault used a gyroscope to demonstrate the Earth's rotation. 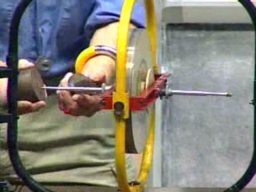 The gyroscope wheel is in a double-axed gimbal mount, so that the force of gravity acts on the wheel's center of mass, and no torque is acting on the wheel. Without torque to change its direction of motion a spinning gyroscope wheel will remain pointing in the same direction. An object left to free motion will move in a straight line. The spinning of the gyroscope wheel can be thought of as combining two oscillations, perpendicular to each other. Each of these oscillations remains on the same line, making the plane that is defined by the two perpendicular lines a stationary plane. Hence the spin axis, perpendicular to the plane, keeps pointing in the same direction. I will use the following naming convention: I will take the word 'gyroscope' to refer to the assembly of gyroscope wheel and all of the suspension mount together. I will call the spinning mass - usually a disk-shaped object - the 'gyroscope wheel'. 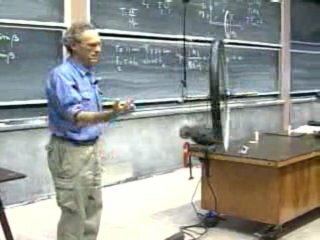 The image shows a demonstration from a lecture by professor Walter Lewin. Using an electric motor he spins up a bicycle wheel to a hair raising velocity, and then he hooks up the wheel to a rope suspended from the ceiling. Initially, walking up to the rope, he supports both ends of the axle. When the rope takes the weight the wheel starts precessing. Picture 2, picture 3, image. Pictures 4 and 5 show a gyroscope in a multi-axed gimbal mounting. The yellow housing enables swivel, the red housing enables pitch. The wheel's bearings rest on a fixed axle that extends out of the red housing. Notice especially the instant at 47:10, when professor Lewin happens to manipulate the yellow housing. 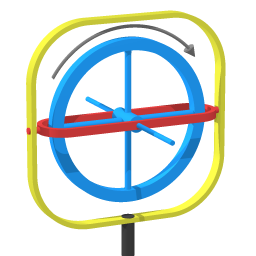 The turning of the yellow housing is transmitted to the gyroscope wheel, and just for a moment you can see how the gyroscope wheel responds to that. Picture 4, picture 5, image. The purpose of this article is to show how to understand the behavior of the gyroscope in terms of the laws of motion. 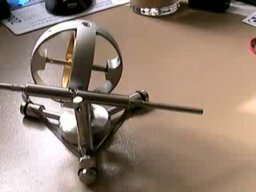 Image 6 represents the gyroscope in the demonstration by professor Lewin. To emphasize the different components I gave them contrasting colors. Swivel : rotation of the yellow housing. The swivel axis has the least freedom; the swivel axis is fixed relative to the ground. 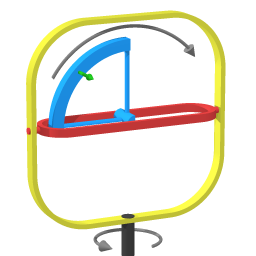 The pitch axis is always perpendicular to the ground, as it is constrained by the yellow housing. The innermost housing, the red housing, has the most freedom. So the roll axis can point in any direction. 'Roll' has been defined as spinning of the wheel. That means roll is defined relative to the wheel. Image 7 depicts the gyroscope when it is precessing. The brown cylinder represents the weight that has been added on one end. If the gyroscope wheel would not be spinning the weight would pitch that end all the way down. In the demonstration the spin rate is much faster than the precession rate, so it's natural to think of the overall motion as a composition of two perpendicular uniform rotations: rolling and swiveling. Image 7 shows two black arrows to depict the wheel's two component rotations. Rather than trying to focus on a section of wheel, trying to track it, it's clarifying to look at how the parts of the wheel move through successive quadrants. Image 8 shows one such quadrant. As the wheel spins wheel mass moves through that quadrant. In the quadrant shown in image 8 the mass of the wheel is moving towards the swivel axis, and so is the mass moving through the diagonally opposite quadrant. We have that when circumnavigating mass is pulled closer to the axis of rotation (the swivel axis in this case), that mass tends to pull ahead of the overall circumnavigating motion. The green arrow depicts that tendency. In the other two quadrants the mass of the wheel is moving away from the swivel axis, so the mass in those quadrants tends to lag behind the overall swiveling motion. The four green arrows in image 7 illustrate that the effects from each of the four quadrants combine to a pitching effect. The effects from each of the four quadrants add up: they reinforce each other into a single pitching effect. In particular, this explains why a gyroscope wheel has its strong response at a 90 degrees angle. It's at 90 degrees because of the overall symmetry: the contribution of each of the four quadrants is the same, therefore the response can only be at that 90 degrees angle. 48:00 into the video, only seconds away from adding a weight. Image 9 is at 48:00 into the video. Let me go step by step over what happens at the exact instant that the weight is added. 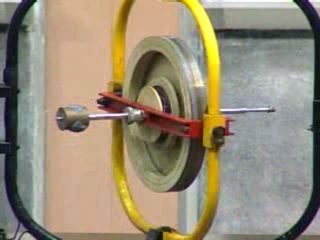 When the weight is positioned onto the axle rod the force that it exerts starts to pitch the gyroscope wheel. The pitching motion causes swiveling motion: precession. The precessing motion adds a tendency to pitch up, counteracting the downpitching tendency from the brown weight. The gyroscope settles into a sustained dynamic configuration, neither pitching up nor pitching down. Settling into the precessing motion happens very quickly; you don't actually see it happening. It may look as if the wheel's motion has changed directly to the final precessing motion, but in fact it has gone through the above described process. 38:20 into the video. Faster precession when extra torque has caused further pitching down. Due to the fact that the gyrocopic effect is a response to motion the process of settling into precessing motion is self-adjusting: the final precessing rate is the amount of precession that keeps the wheel from pitching down further. Picture 10 (38:20 into the video) shows what happens when more weight is added. The added weight increases the torque, so the wheel pitches down some more. The motion of pitching down causes the precession to speed up. 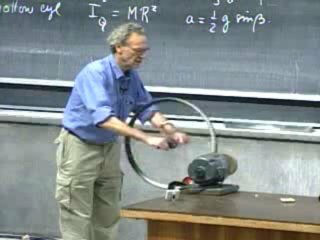 Note that professor Lewin increases the torque load gingerly. An uncontrolled drop of the extra weight would add a nutation. See the nutation section further down in this article. 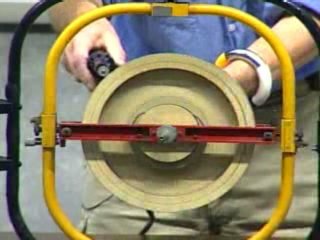 If the demonstration is allowed to play its course then friction will keep reducing the wheel's spin rate. The wheel will progressively pitch down, with corresponding increase in precession rate. (Actually, as the wheel pitches down the torque from gravity becomes smaller, making the requirement for precession lower.) Eventually the spin axis will be practically parallel to the direction of gravity. Precession will only start if a force sets it into motion, but once precession is going it simply goes on. For comparison: the example of circular motion, sustained by a centripetal force. The centripetal force doesn't cause or sustain the speed; the centripetal force causes/sustains the circumstance (the circular shape of the trajectory) that allows the speed to continue. Likewise, once there is a uniform precession going the torque is neither causing nor sustaining the precession. The torque sustains the dynamic configuration in which precession can exist. Spring tension preventing further pitching. Next, let me discuss what you see in the following YouTube gyroscope video, which according to the profile information has been uploaded by a user named Glenn. You can see how Glenn is swiveling the gyroscope wheel and in response the gyroscope wheel is pitching up and down. There are two cross-arms, and two helical springs act to keep those cross-arms level. At 20 seconds into the video Glenn starts a steady precession. Without the springs the gyroscope wheel would pitch over completely, to the point where the spin axis coincides with the swivel axis. (That point is the point with lowest potential energy.) As the cross-arms pitch a spring is stretched until the point is reached where the tension matches the tendency to pitch over. Air friction is slowing down the gyroscope wheel, as friction cannot be eliminated entirely. As the spin rate decays the tendency to pitch decreases. This allows the stretched spring to pull the cross-arms to a more level position. The pitching motion of leveling out reduces the existing precession rate. When the cross-arms have leveled out completely the precession has been nullified. 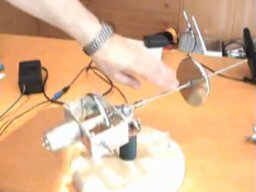 A Youtube gyroscope video uploaded by Adolf Cortel shows nutation. At one minute into the video Cortel gives a jolt to the system. That induces a nutation on top of the precession. The cycle of nutation proceeds as follows: pitching down is converted to swiveling clockwise, which is converted to pitching up, which is converted to swiveling counterclockwise, which is converted to pitching down, and so on. The result is that the nutation traces out a cone with respect to the steady precessing motion. Nutation is like circular motion in the following way: it cycles around a point of lowest energy. If there is damping then the nutation spirals in, settling on the point of lowest energy. This mathematical section is for corroboration. The result matches the result that is calculated with other mathematical means (involving Euler angles). The combined effect of the four quadrants can be calculated by integrating around the wheel, which means integrating over an arc of 2π radians. 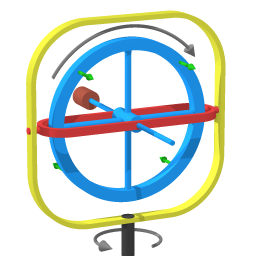 The purpose of the calculation is as follows: when the gyroscope wheel is precessing (as depicted in image 7) the precession gives a tendency to pitch. The derivation finds the corresponding torque. The following integration applies the usual simplification that the gyroscope wheel is treated as if all of it's mass is on it's circumference. An actual wheel can't be like that of course, since you need spokes. But the mass of the spokes is much less than that of the rim, so for a first approximation the mass of the spokes can be neglected. Let me go over the entries in the above table. - The 'force in tangential direction' refers to a force that tends to pitch the gyroscope wheel. - 'Velocity component towards/away from central axis'. At the points where the wheel rim is farthest away from the swivel axis the velocity component in radial direction is zero. The radial valocity is maximal when θ is 1/2π and 3/2π. Expression 5 gives the tendency to pitch that arises from the gyroscopic precession. It is proportional to the swiveling rate ωs and the angular momentum Lr of the rolling gyroscope wheel. 1. First I answer the question: if circumnavigating mass is pulled closer to the axis of rotation with a particular radial velocity, how large will it's tangential acceleration be? 2. 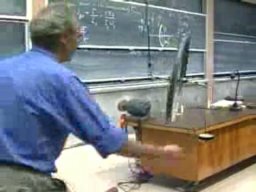 Then I turn that around: the amount of force that is necessary to prevent angular acceleration is proportional to the tendency to accelerate. Step 1. is the case where angular acceleration is not prevented (that is: no torque), which means that angular momentum is conserved. Using the chain rule to obtain an expression in terms of a factor dr/dt . r(dω/dt) = at = the tangential acceleration. This expression gives the tangential acceleration that occurs if there is no torque present. The above completes step 1. of the two steps. Step 2. is to see that if at every point precisely that force is exerted (in the opposite direction) then change of angular velocity is prevented, and the part will remain moving in radial direction with the same velocity.